Kerala's Younus Ilyas, of Race Concepts, took top honours at the Sprint de Bengaluru, a curtain-raiser event for this year's Indian National Rally Championship season. 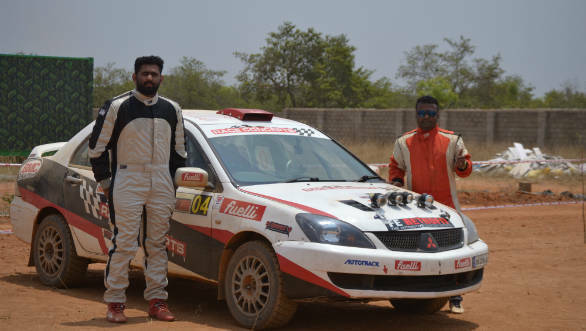 Ilyas along with co-driver Harish Gowda, were impressive throughout, eventually topping both, the INRC Overall and INRC 2 categories. Ilyas and Gowda started with a ten-second lead at the end of the 5.5 kilometre-long night stage held on Saturday. The two stages on the Sunday were held at LG Tranquil, where drivers found tarmac, gravel, loose soil, sharp climbs and steep falls that marked the route quite challenging. In the first stage on Sunday, Dean Mascarenhas started to pose a strong challenge for the win. His INRC 3 stock car was at a disadvantage when placed alongside IIyas' specially prepped Mitsubishi Cedia, but Mascarenhas only trailed by two seconds. This close contest continued in during the second stage too, with Dean clocking 4m 58.30s which was just one second behind Ilyas. The next two stages were held at LG Champions County. Here drivers encountered long straights and sharp curves. Mascarenhas capitalised on this change of scenery, winning both stages, and managing to close the ten-second gap from the first two stages, gaining nine and then eight seconds on Ilyas. But sadly for Mascarenhas, he was handed a six-minute penalty (for reaching the starting point late for Saturday's stage). This dropped him right to the bottom of the pack and handed Ilyas the win. Suhem Kabeer and J. Jeevarathinam took the INRC 1 win, while Dhruva Chandrashekar and Musa Sherif took the win in INRC 3, and also took second place overall. Other winners were Sanjay Agarwal/Smitha N. in the FMSCI 4WD Cup and Vaibhav Marathe/Arjun S. S. B. in the FMSCI 4WD Cup. Shivani Pruthvi and Deepti Pruthvi won the Ladies Class. Speaking of the disappointing end to the event, Mascarenhas said, "It was just bad luck. My car didn't start so I got delayed. I am, however, very happy with the way I drove and I am looking forward to a good season." Ilyas said of his win, "It was a great outing. And I loved being out here! The stages were interesting and were challenging at times. But I am really glad to have come out on top."